With her joyful DIY approach our ukelele girl has got it covered. A ray of sunshine every time we press play, Sophie Madeleine’s second album ‘The Rhythm You Started’ has been brightening up what can only be described as a lacklustre summer. The title track sparks along with close harmonies, handclaps and plenty of ‘ba ba ba’s – scientifically proven to be 37% more cheerful than ‘la la la’s – while ‘Come Follow Me’ wraps you up in a melodic duvet that will make you melt. Across 10 very catchy tracks, we were instantly reminded of 60s French songstress Francoise Hardy even before we saw Sophie’s pretty, classic look. It’s such a joyful spirit-lifting affair we just had to meet her to see if she was as sunny in real life. So, is she a jolly person? She says she had years of writing miserable songs that no one really identified with, so decided to write some chirpy numbers. It’s certainly worked, and tracks like the gorgeous ‘Star’ – all simple ukulele strums and plaintive violins – will have you skipping to work days after you last heard it. It’s a fuller sound than her beloved debut, ‘Love. Life. 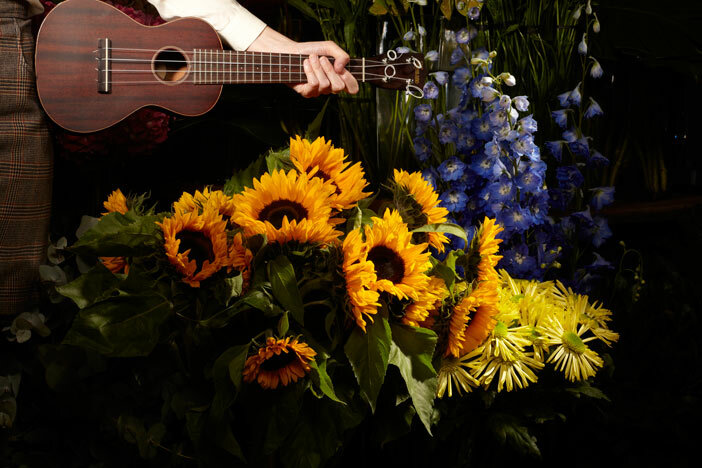 Ukulele.’ – less raw and more percussive but still full of charm. You might think she’s doing well to provide earworms of such tenacity by album two but Sophie is a bit of songwriting boffin, having studied the form for years, ending up with a masters degree in making milkmen whistle. In fact her first LP came from her post-graduate course. Needless to say, she passed. Now she’s put her own band together and is looking to promote her LP in New York, a place that’s almost a second home to her and already full of fans. Before she heads off she’ll be popping into our SOURCE New Music night next month. Having discovered that – despite her protestations – Sophie’s as sunny in real life as she is on record, we can’t wait to see her perform. Maybe she’ll bring on an Indian summer.